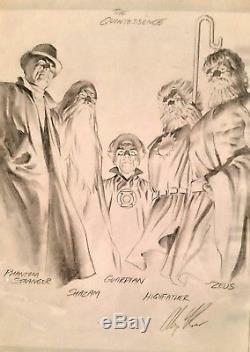 Offered is an ORIGINAL ARTWORK from Alex Ross that features THE QUINTESSENCE... Phantom Stranger, Shazam, Guardian, Highfather, and Zeus. 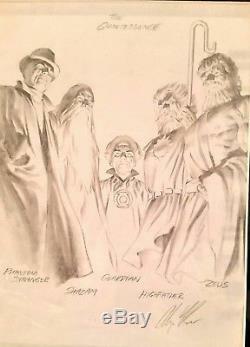 This is an ORIGINAL DETAILED PENCILS / ARTWORK SKETCH of DC's Original Godfathers. This incredibly detailed work is pencil on art paper and measures 8/12" x 11". The artwork is also HAND SIGNED by Alex Ross. The item "Alex Ross THE QUINTESSENCE ORIGINAL DETAILED PENCILS / ARTWORK SKETCH" is in sale since Saturday, April 07, 2018. This item is in the category "Collectibles\Comics\Original Comic Art\Drawings, Sketches". The seller is "isaiahscomics" and is located in Weatherford, Texas. This item can be shipped to United States.